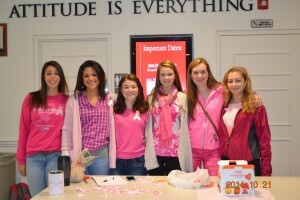 CBNA FBLA Members Cara La Plante, Alandra Beaver, Meghan Percy, Brittany Guillemette, Daphne Jordan and Katherine Hyland help hand out breast cancer awareness materials at CBNA’s “Pink-Out” day. The Coe-Brown Northwood Academy chapter of Future Business Leaders of America (FBLA) has been extremely busy during the first part of the school year. Members Nicole Beaupre, Meghan Percy, Andrew Shultz, Alex Yonchak, Brittany Guillemette, and Daphne Jordan, along with advisor Dr. JoAnn Zylak, attended the annual FBLA Fall Leadership Workshop on Thursday, October 9 at Southern NH University. These six members got a chance to meet the State Officer team, had a workshop by an inspirational speaker on “It’s Up to You!” and attended workshops on Team Building/Leadership Training and on Law Enforcement/ Leadership in the community. 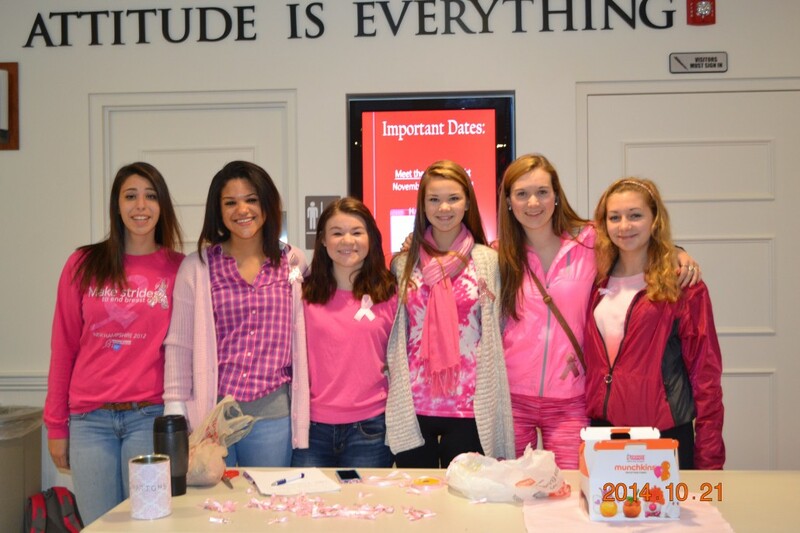 The chapter participated in Breast Cancer Awareness on October 22 at CBNA—wearing all pink, giving out pink ribbons, and sharing breast cancer statistics (awareness) through announcements during the week. Members have already been taught to juggle by faculty member Greg Samuel to learn the concept of juggling life activities at an FBLA workshop here at CBNA, and are participating in the LifeSmarts competition online. In the future, the chapter will be Helping Veterans through awareness on Veteran’s Day, by walking in the Veteran’s Day Parade in Manchester, and by volunteering to help serve at a veteran’s breakfast in Manchester. CBNA FBLA also participates in the Multiple Sclerosis Walk and Awareness every April in Manchester and collects throughout the year for the MS Society and the March of Dimes to help find cures, and will have guest speakers at the FBLA Induction Ceremony on Nov. 10 to get more information about these debilitating conditions. FBLA members are also collecting for Children’s Hospital at Dartmouth, and have already donated all their “tip” money earned by working at the Farmer’s Market Booth at Deerfield Fair and will continue collecting for CHaD until March of next year to help children in need. 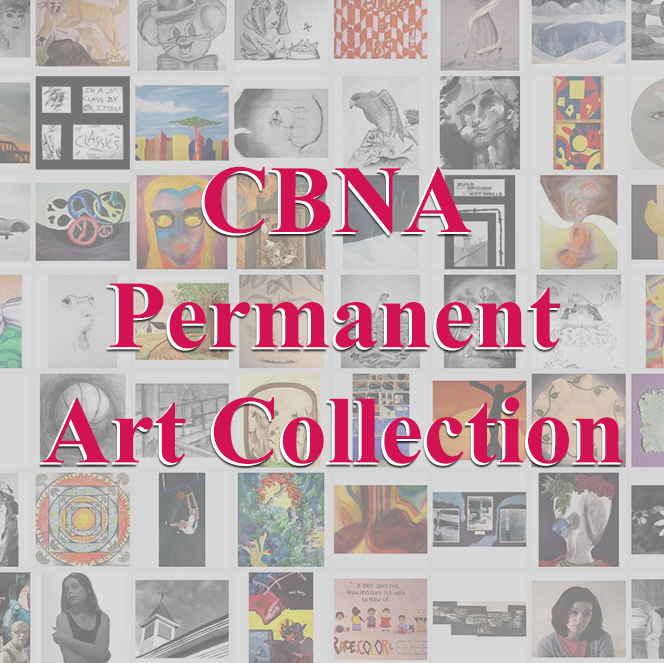 Members have made a children’s piggy bank which is available for donations at CBNA. In addition, members are involved with Diabetes awareness activities and hope to have a Virtual Business Challenge going throughout this year. More guest speakers and conferences as well as a spring competition in various business, computer, math, and economic areas are planned.